Not long after its authorized publication in 1787, Jefferson's Notes on the State of Virginia became the Bible of backcountry travelers, reverently quoted and religiously followed. No less a landmark was Monticello, where many of those travelers came knocking, hoping to meet the author, a landmark in himself. Thomas Jefferson. Notes on the State of Virginia. London: Printed for John Stockdale, 1787. Jefferson's personal copy. Includes A Map of the Country between Albemarle Sound, and Lake Erie, Comprehending the Whole of Virginia, Maryland, Delaware and Pensylvania, with Parts of Several Other of the United States of America. Shown: Title page. Notes on the State of Virginia is Jefferson's only full-length published book, written in response to a 1781 questionnaire sent him by François Marbois, then Secretary to the French Legation in Philadelphia. After Jefferson circulated a few privately printed copies in 1785, the threat of an unauthorized French translation led him to publish authorized editions of the book in French and English in 1787. The volume displayed here was Jefferson's own copy, in which he penned about 500 lines on 50 pages and added 16 pages of original manuscript. The map Jefferson prepared to accompany his Notes was based on the Map of the Most Inhabited Part of Virginia published in 1754 by his father Peter Jefferson and Joshua Fry. Although the Fry-Jefferson map was the first map to show the Appalachian Mountains running in the correct direction, it showed three Peaks of Otter instead of two, an error Jefferson corrected in his own map, also issued separately from the Notes. 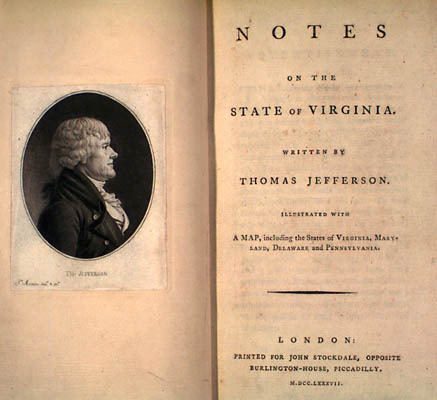 As Charles A. Miller has written, Jefferson's Notes might just as well have been titled "Notes on American Nature," so vast was the "State of Virginia" at the time. Jefferson, however, was best informed about the landmarks that lay in his own backyard--the Blue Ridge Mountains and Shenandoah Valley. Isaac Jefferson. Daguerreotype, c. 1840s. Son of the slaves "Great George" and Ursula, Isaac Jefferson was born in 1775 at Monticello, where he lived for most of his life. Trained as a metalworker during the 1790s, Isaac became proficient as a tinsmith, blacksmith, and nailer. How Isaac gained his freedom is unknown, as are the fates of his wife and two sons. Isaac Jefferson. 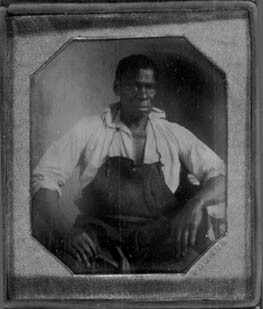 Life of Isaac Jefferson of Petersburg, Virginia, Blacksmith. 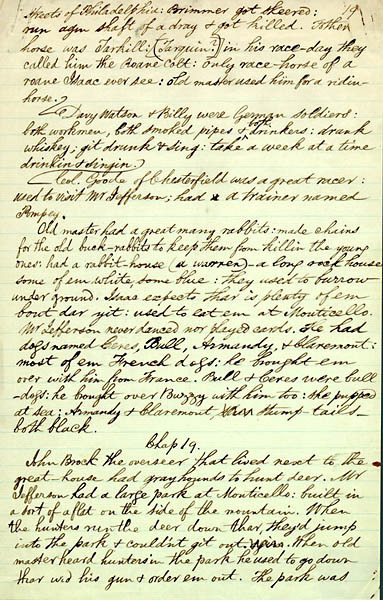 Manuscript, 1847; copied, c. 1871; by Charles W. Campbell. Shown: Chapter 19. Mr. Jefferson had a large park at Monticello: built in a sort of a flat on the side of the mountain. When the hunters run the deer down thar, they'd jump into the park & couldn't git out. When old master heard hunters in the park he used to go down thar wid his gun & order em out.